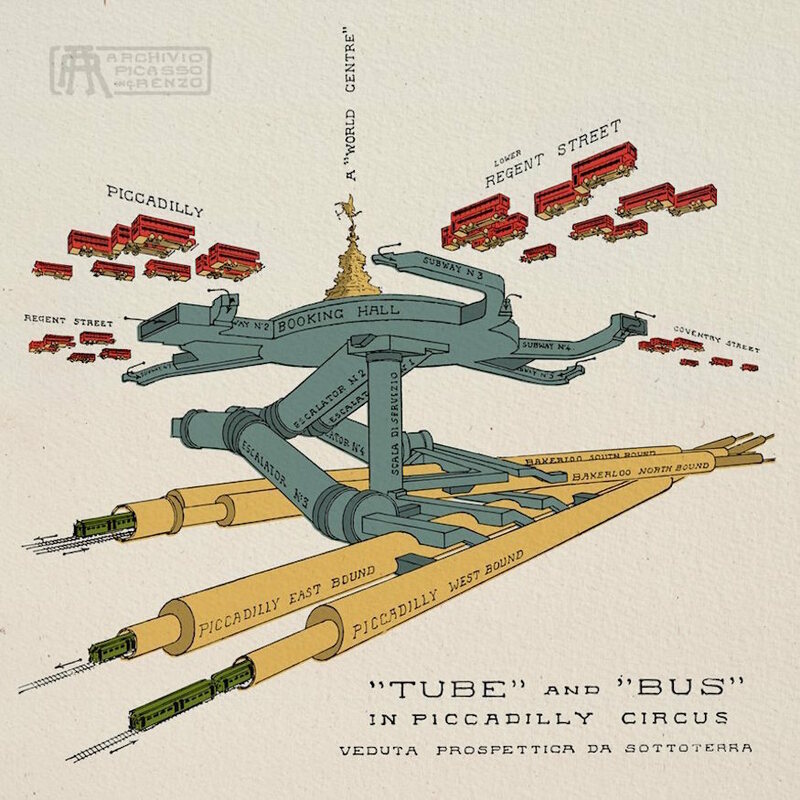 Piccadilly Circus tube station by Renzo Picasso, 1929. Pedants may note that the traffic flow has been reversed, as it would be in Italy. Copyright, Archivio Renzo Picasso, Genoa. The layout of London can only be fully understood if we examine it in three dimensions. Tim Dunn takes a look at some of the capital's greatest cutaway diagrams. Our city is a fascinating, infuriating, terrifying, beautiful place. As curious Londonists we attempt to make sense of it and the way it works so that we can better assert our own place within it. It is often said that London is an infrastructural palimpsest: layer upon layer of networks and systems. But that really isn't the case. London, like any urban form is a complex, woven fabric of infrastructure — each system maddeningly intertwined with others. 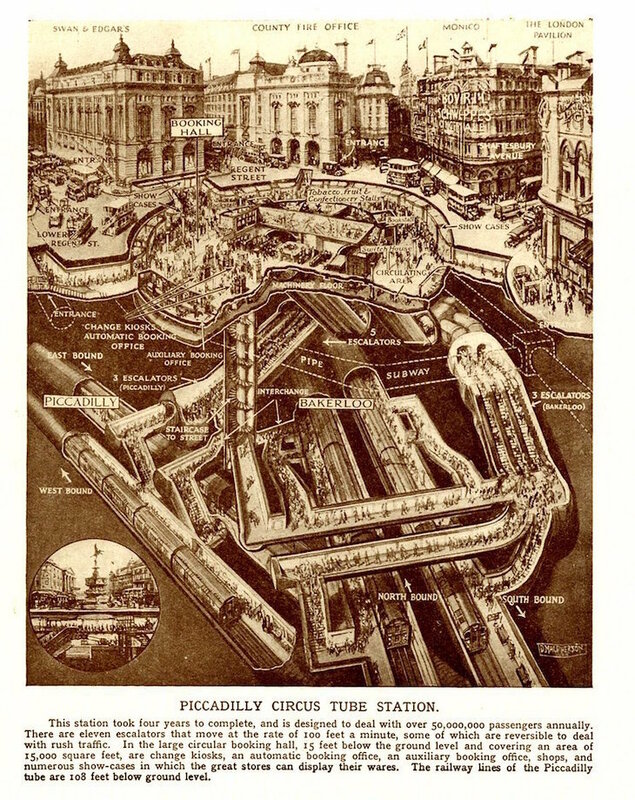 1930, D MacPherson's cluttered cutaway of Piccadilly Circus underground station to explain the complexity of works to the excited public. (c) London Transport Museum Collection. Ancient, hidden rivers don't just flow under our modern railways — today they flow above them on aqueducts and in pipes. Crossrail ducks beneath some Underground lines and rises up above others. 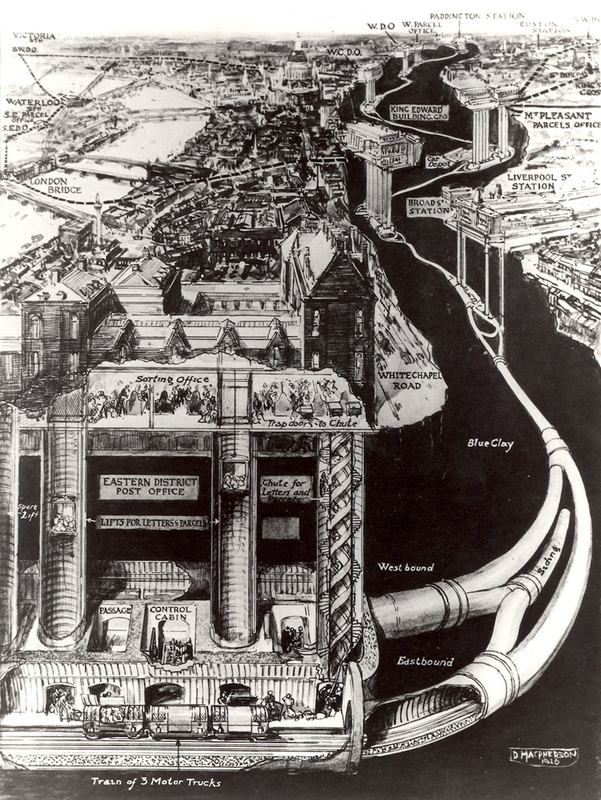 The remarkable London Hydraulic Power Company's pipes squeeze in and out and through and down between systems that came before them. Above ground road, rail and power infrastructure networks criss-cross each other, often obscuring what could be seen before. A two-dimensional map, while often brilliant and beautiful in its own right, is never quite enough to explain what is going on in this city. We need more. 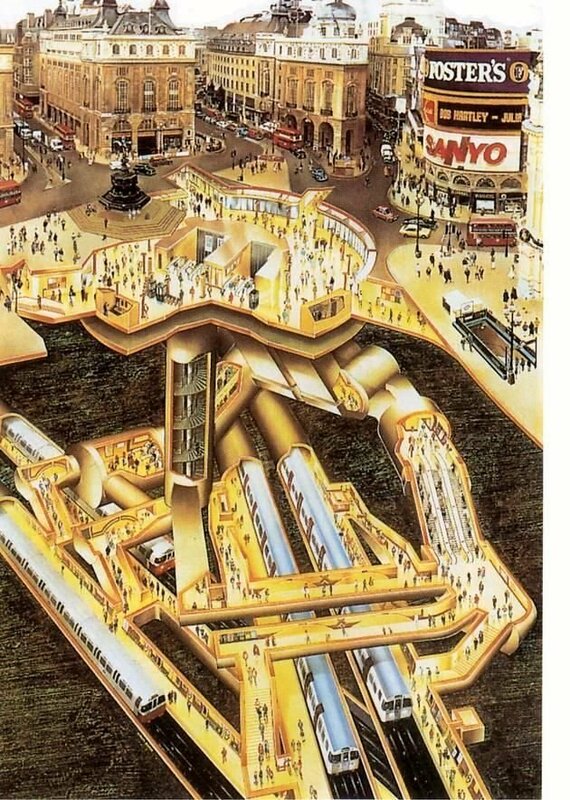 1989, London Transport Museum commissioned Gavin Dunn to draw this updated modern 3D cutaway of Piccadilly Circus station. (c) London Transport Museum Collection. To make sense of this jam-packed, twisting, stacked-up city, or indeed the objects that exist within, we have to look at the spaces, places and things in three dimensions. 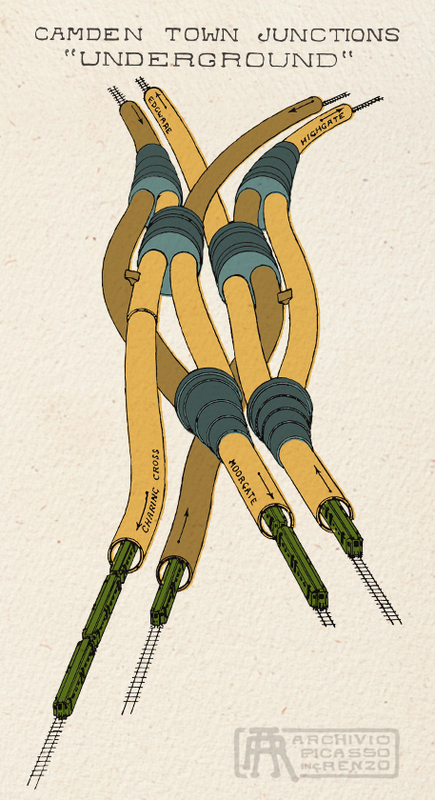 And that is where the remarkable world of the cutaway comes into its own. 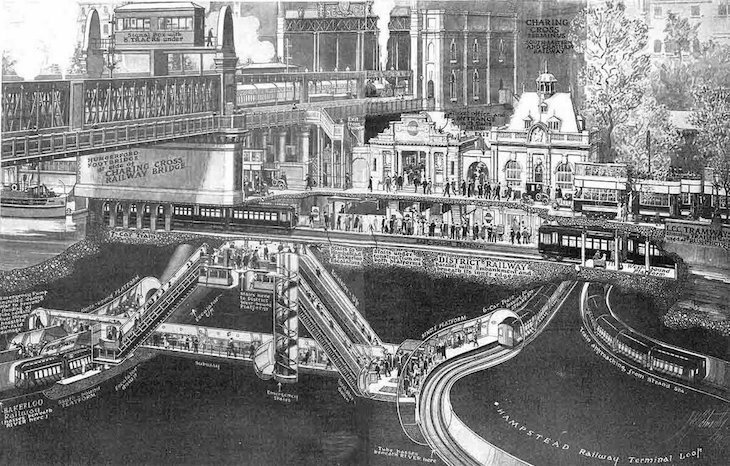 Cutaway of London's Charing Cross railway, underground and trams. Popular Science Magazine 1921. Click or tap for higher resolution. The cutaway diagram has its roots in the Renaissance, where illustrators sought to explain subterranean mining through printed works. Those simple drawings became ever more complex as our technology and our places became harder to explain. 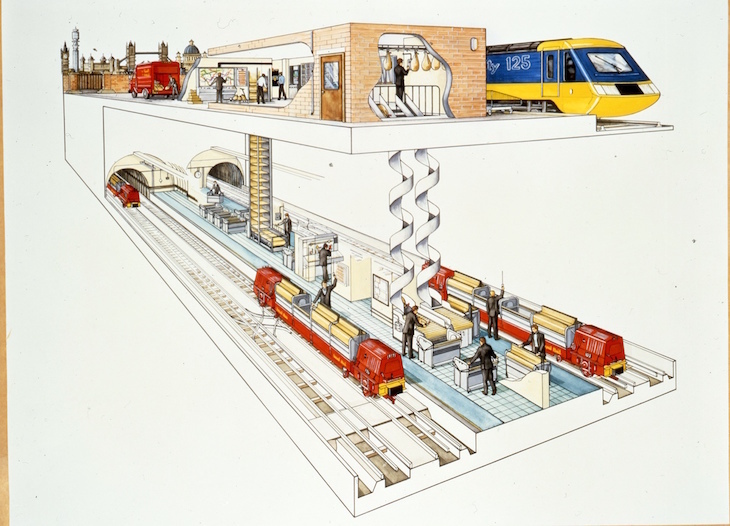 It was in the 20th century that cutaways became most popular, as demand for education and explanation of transport networks and technology rose. Bond Street Station, 1970s. Showing reconstruction for the Jubilee Line. It also references the Fleet Line as the Jubilee was known during the planning phase. (c) London Transport Museum Collection. 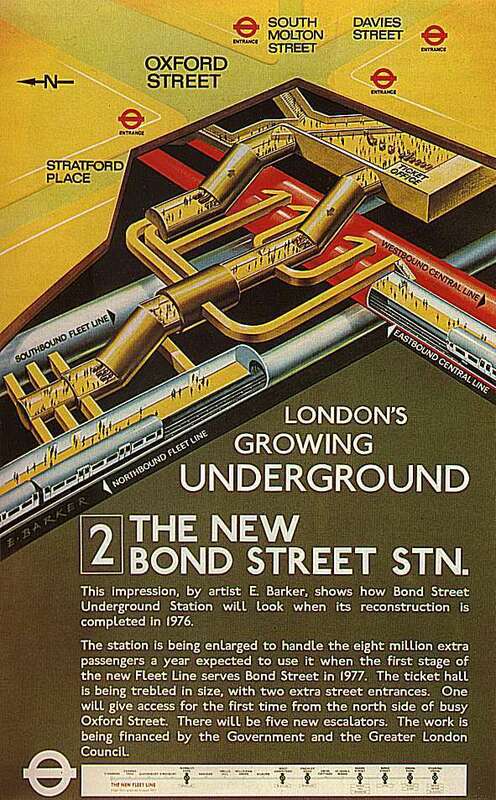 London, having such an incredible array of transport infrastructure — much of it below ground — has therefore yielded a remarkable quantity of cutaway diagrams. They have been produced for children, for professionals, for the public, for government — each with a different objective in mind. Copyright, Archivio Renzo Picasso, Genoa. Many readers will be familiar too with the work of Lesley Ashwell Wood, who published a vast repertoire in mid-century Eagle comics. A lovely review of his work can be found online. Camden Town by L Ashwell Wood for the Eagle comic. (c) Eagle, Dan Dare Corporation. 1950, a cutaway of 1938 stock on London Underground in the Eagle comic - courtesy of Ian Visits. (c) Eagle, Dan Dare Corporation. The Post Office Mail Rail diagrams are a delight, and the 1926 version bears comparison with the 'Overground Piccadilly line' diagrams, of which various versions have been printed and mounted in Piccadilly line trains over the years near the doorways. Mail Rail 1926 cutaway of the entire route. Copyright Royal Mail Group Ltd, courtesy of the Postal Museum. And here's another from 60 years later, showing the Paddington Mail Rail station. 1980s, Mail Rail's Paddington station transfer from British Rail to Mail Rail. Copyright Royal Mail Group Ltd, courtesy of The Postal Museum. As a final bonus, we've included a cross-section of something at the centre of a global network: Television Centre at Shepherd’s Bush. The plan is from July 1958 and you can find more out about it here. 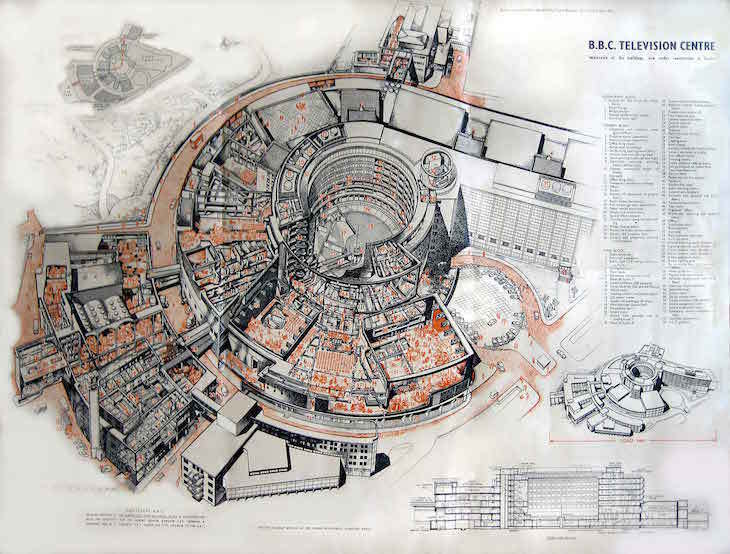 TV Centre cutaway drawing. (c) The Architect & Building News, 1958. Click or tap for higher resolution. Of course, a cutaway, like any illustration or interpretation, is never going to be entirely accurate. It is going to have elements removed — not just because it's a cutaway and we need to see past stuff but because the illustrator or commissioner of the drawing doesn't think they are relevant, or shouldn't be included. Others add in extra bits too – because they're making a best guess. After all, who really knows the extent of what is under London’s streets? Please do post links to more cutaways of London below. With thanks to London Transport Museum, the Postal Museum, Ian Visits, Renzo Picasso Archive andBear Alley. See also: How deep does London go?